Ten-year-old Bud Caldwell is a motherless child in search of his father during the Great Depression. 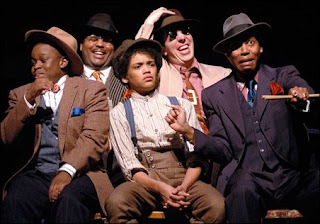 Bud has pluck, hope and a battered suitcase full of clues to the family he longs to find: a handful of rocks with numbers written on them, a picture of his mama as a young girl, and a flyer advertising a performance by Herman E. Calloway and his jazz band — the Dusky Devastators of the Depression. Zupanc, a three-time McKnight Fellow and a 2005 Bush Foundation Artist Fellow, has been the music director at CTC for 17 seasons. He worked closely with the play's director, Marion McClinton, an Obie winner, Tony nominee and renowned director of August Wilson's plays. MinnPost spoke with Zupanc, winner of numerous awards, on his way home from a five-hour rehearsal. Jazz informed more than the music — it also guided the cast. Zupanc explains: "Right off the bat, McClinton said, 'You guys need to figure out what instruments you are. This is a jazz play, and you are instruments. You need to learn about the characteristics of your instrument. That's how you do your lines. That's how you deliver. That's how you act.' It made sense to me. I was doing the same thing, literally, with the music." For his research, Zupanc listened to music of the era: Billie Holiday, Coleman Hawkins, Lester Young. Familiar tunes emerge in his score: a swinging "No Place Like Home," bits of "God Bless the Child," Duke Ellington's "Mood Indigo." Cole Porter's "You'd Be So Nice to Come Home To" brackets the play, during a tender mother-and-son dance near the beginning and as a complete performance by vocalist Regina Williams near the end. Were there any big discoveries during Zupanc's research and writing phase? "YouTube," he says. "I was able to go on YouTube and watch these people perform — Lester, Billie, Charlie Parker. I thought YouTube was all Hannah Montana and contemporary things, but there are thousands of clips of early recording sessions." The video website also helped the actors. "I was able to tell them, 'Check out YouTube and watch this trumpet player and that sax player. Look at how they act, notice their mannerisms.' " There's a magical scene late in the play where Shawn Hamilton, Samuel G. Roberson, Namir Smallwood, Kevin D. West, and Payton Woodson lift "instruments" shaped from wire, the music begins, they strike a pose, and it's real. Most of the music was prerecorded by Zupanc on keyboard and percussion and Brian Grivna on reeds (saxophones and clarinet). Grivna's jazz pedigree includes years with the Buddy Rich band and many performances at local clubs. Grivna, an adjunct faculty member at the University of Minnesota and former staff woodwind performer for the Guthrie, also plays for the St. Paul Chamber Orchestra and the Minnesota Orchestra. "He's the best," Zupanc says. "His wealth of experience is so deep, and he plays all the horns." Performances by the luminous Regina Williams are live, not prerecorded. Like most other adults in the cast, Williams has multiple roles in "Bud, Not Buddy." In the first half of the play, she's an abusive mother in a foster home and a kind mother in a shantytown. In the second half, she's the singer for Calloway's band. Williams, a local treasure, is a former Sounds of Blackness member and current company member of Penumbra Theatre. If you missed her brilliant star turn as Dinah Washington in Penumbra's musical drama "Dinah Was" in 2003, you can kick yourself now. "Working with her is a joy," says Zupanc. "She's a generous person and extremely talented." Nathan Barlow, a junior at the St. Paul Conservatory for Performing Artists, carries most of the play's weight on his 16-year-old shoulders as Bud. A gifted young actor who has appeared in 11 previous CTC productions, he also plays the saxophone in his school band, which comes in handy during the final scene. Zupanc enjoyed working on "Bud, Not Buddy," immersing himself in the music and laying down tracks in his home studio. "I'm a big fan of music of that era, and of jazz." Which local jazz musicians does he enjoy? He doesn't get out to clubs as often as he would like — a price one pays for working in theater. But when he does: "Brian Grivna, of course. Dennis Spears. Ginger Commodore. Debbie Duncan. And I think our resident genius is Adi Yeshaya. He's an amazing arranger and composer." Valves Meet Slide: It's going to be c-c-c-cold this weekend. Warm up at the Artists' Quarter's first-ever Sunday Afternoon Jazz Party. Trombonists Dave Graf and Brad Bellows will perform with the always-hot rhythm section of Peter Schimke on piano, Gordy Johnson on bass and Mac Santiago on drums. Free hors d'oeuvres, too. Read a preview here. The Artists' Quarter, 3 p.m. to 7 p.m. Sunday, Jan. 20 ($7). Soul Café: I almost hate to include this in the picks because if it sells out before I get there (after Valves Meet Slide), I'll be mad. But not including it would be a sin. Phil Aaron on piano (sitting in for Soul Café regular Laura Caviani), Brad Holden on alto sax, and Steve Blons on guitar play the music of Miles Davis; Robert Bly reads his own poetry. Minnesota will name a poet laureate sometime this month, and if Bly isn't it, I'll eat my sonnet. Save me a seat. The Art Gallery at Hennepin Avenue United Methodist Church, I-94 at the Lyndale Exit, 7 p.m. Sunday, Jan. 20 ($10 requested donation). Jazz at Lincoln Center Orchestra with Wynton Marsalis: A very big gig. Remember when the Metropolitan Opera came to Northrop? This is the jazz equivalent, without the sets. The program: "Ellington Love Songs," which JALC will play in New York over Valentine's weekend. "Mood Indigo," "Satin Doll" and more. Orchestra Hall, 7:30 p.m. Monday, Jan. 21 ($12-$77). Jazz 101: What Is Jazz? Serial Killers Read Garrison Keillor!